Description: Last summer, Mackenzie Bishop, a Keeper tasked with stopping violent Histories from escaping the Archive, almost lost her life to one. Now, as she starts her junior year at Hyde School, she's struggling to get her life back. But moving on isn't easy -- not when her dreams are haunted by what happened. She knows the past is past, knows it cannot hurt her, but it feels so real, and when her nightmares begin to creep into her waking hours, she starts to wonder if she's really safe. Meanwhile, people are vanishing without a trace, and the only thing they seem to have in common is Mackenzie. She's sure the Archive knows more than they are letting on, but before she can prove it, she becomes the prime suspect. And unless Mac can track down the real culprit, she'll lose everything, not only her role as Keeper, but her memories, and even her life. Can Mackenzie untangle the mystery before she herself unravels? With stunning prose and a captivating mixture of action, romance, and horror, The Unbound delves into a richly imagined world where no choice is easy and love and loss feel like two sides of the same coin. There is nothing quite like The Achieved with its haunting setting, dark corners, memorable characters and beautiful prose. It’s a book that you should read if you haven’t already. 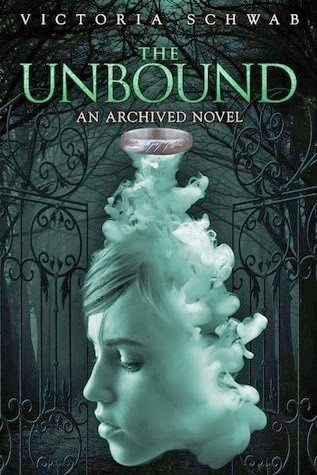 Ever since I finished The Achieved, I have been eagerly waiting for The Unbound to release. Now I can happily say that The Unbound is even better than its predecessor. It’s a hauntingly beautiful book filled with raw exposed emotions as Victoria Schwab unravels Mackenzie’s life and fills it with doubt, trust, love and nightmares. The Unbound lives up to its namesake as it centres on Mackenzie facing her nightmares and piecing herself back together. It’s a soulful read, one that takes a peek behind the armour of Mackenzie Bishop. More often than not we don’t get to see a real glimpse of the consequences that can haunt a protagonist. I have read plenty of books that have the protagonist going through hell and back only to appear stronger than ever as though nothing can faze them. To me, this never seems realistic as all actions have lasting consequences that affect people mentally and/or physically. This is where The Unbound shines. Not only do we get a story about the secret library of the dead, we get a beautiful heartbreaking story about a young girl who has a lot on her plate. Mackenzie has been through a lot with Owen and now has the shadow of The Archive looming around her. In the Unbound she is pushed to the max and is forced to face her nightmares, which have been causing her to lose sleep and sanity. The nightmares are now seeping into her everyday life, putting her on edge. Mackenzie has to fight not only for her but also for those she loves. The major themes of this book are secrets and trust. There is more of a concentration on the weight of secrets and how lies can wreck havoc. The relationship between Mac and her parents is pushed to the brink due to Mac’s secret life. Schwab beautifully showcases all of the fears and doubt Mackenzie carries with her. It lets us see her venerable side and how it ultimately makes her stronger and willing to protect those around her and the life she has. Mackenzie’s story really pulls at your heartstrings. We get to meet new characters at Mac’s new school. Each has their own personality and they add to the story in their own way. Hyde School is really old and it’s atmosphere fits perfectly into The Unbound. Owen’s presence in the book is palpable. He haunts Mackenzie like he haunts the pages of this book and he still plays a very big part of this story. Roland is still as wonderful as ever as Mackenzie’s guardian. We get more of a glimpse into his life. Now lets talk about the other wonderful part of this book, Wesley Ayers. We get a lot more Wesley and all of his eyeliner. Even though we get more Wesley I still want to know more about him. He is one of my all time favourite characters. If you need a reason to read this book, don’t look further than Wesley. I love the romance in this novel but my only complaint is that it wasn’t enough. I want more Wes and Mac. They have a very special bond forged from the secrets they keep but their relationship is complicated and Mackenzie struggles to let him in. It makes you want them to be together even though you know why Mac is holding him at a distance. The Unbound is a hauntingly emotional must read. Go read this now.